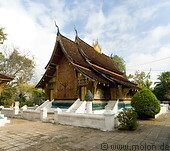 For centuries the Luang prabang province was isolated from the rest of South East Asia by the mountainous territory. Due to recent improvements in the local infrastructure, including the completion of Route 13, and the overall opening of the economy, Luang Prabang is rapidly developing into a major tourist and business centre in northern Laos. Luang Prabang, a UNESCO World Heritage site since 1995, attracts an increasing number of tourists with its mix of gleaming temple roofs, decaying French colonial architecture, beautiful scenery and multiethnic inhabitants. Luang Prabang has changed a lot since my first visit in April 2000.